One of the questions that has been bugging me ever since we first saw the property has been it’s age. Exactly how old is it? This seems like a hard question to answer – at least, answer accurately. I am guessing that it was built in the 1800s and I am assuming that some of the interal features might help dated it. However, often a visit to the Local History unit in the local Library will provide a number of the answers. Well, I have looked into this will previous properties that I have owned so have an idea about the process. With this in mind, I visited the Local History unit in Huddersfield central Library. I was not quite sure how much information I would be able to find – it is very variable depending on the age and area. However, I was very pleasantly surprised to be able to spot the property on an old map. First of all, it was definitely there in 1894. I then looked on the 1854 map and it was there too. Then onto the oldest map in the library. And bingo. It was there too. In 1788! 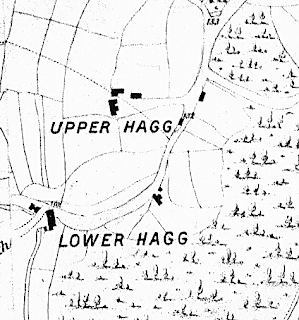 The amazing thing is that the outline of the house really hasn’t changed that much in the past 250 years (it is the “T” shaped building above the letter “A” in “Lower Hagg”. Just compare the scan from the 1788 map with the image from Google earth on my other posting. Almost identical. A quick through the census for 1901 established that the property (10 Hagg Lane as it was referred to then) was occupied by Smith and Mary Littlewood and their three children (Ernest, Wilfred, and Denis) and a step daughter Evelyn Eastwood. Their occupations were listed as Woollen Weaver. The property next door (9 Hagg Lane) is occupied by a 50 year old farm labourer, named Joseph Hobson. The census data can now be accessed online, although I used the microfiche in the library for this purpose. All of this I established within a hour, pretty amazing really. Now to be able to date house any further, I will need to visit the Registry of Deeds in Wakefield. The Registry of Deeds was established by an Act of Parliament in 1704 to allow land holders to register publicly deeds relating to property. But this will have to wait for another weekend!